When I take on MobileSyrup’s Game of the Week column, I typically avoid free-to-play games at all costs, whether they feature in-app purchases or frequent ad placement. In the case of Shooting Hoops, I’ve been forced to make an exception to this rule — the game is just that good. The game’s one-person development studio, led by Faisal Sethi, as with many mobile titles I’ve written about in the past, is easy to pick-up-and-play, but difficult to put down, especially if you put the time in to learn its intricacies. Rather than a traditional get-the-ball-in-the-hoop basketball game, Shooting Hoops puts an amusing spin on this type of game that I didn’t expect. As you may have already expected at this point, your goal is to get the basketball in the net — only in ‘Blast Mode’ a gun that shoots yellow projectiles is attached to the basketball. This gun launches through the air and spins erratically depending on how often and the direction you shoot the yellow projectiles from it. Your goal is to keep the ball under control and manoeuvre it into the basket. While this might sound like an easy task, things get somewhat tricky, particularly during Shooting Hoops‘ later levels when the hoop is placed in awkward positions. Target Mode, Shooting Hoops‘ other recently added game type, is a little more straightforward. You move a target around that then launches yellow projectiles at the basketball. Your goal is still to get the ball in the hoop, which involves launching it into the air with the yellow bullets. Just like in Blast Mode, battling Target Mode’s physics is key to success. As I mentioned before, Shooting Hoops is free-to-play and supported by ads. 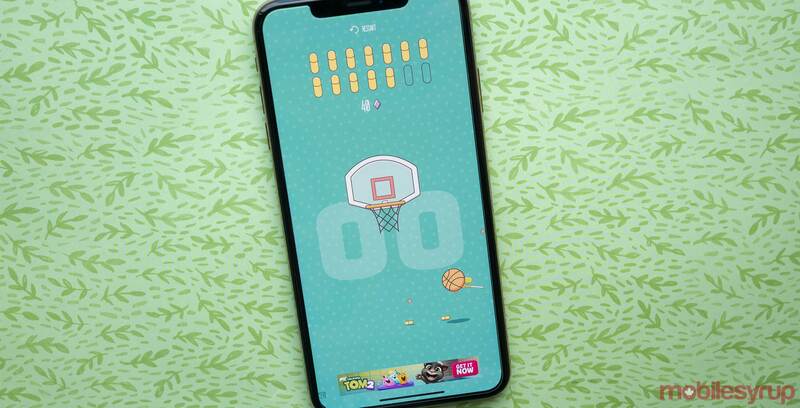 This, unfortunately, means that there are ads sometimes present on lower area of the screen while playing, resulting in the occasional accidental tap while frantically trying to keep the basketball airborne. 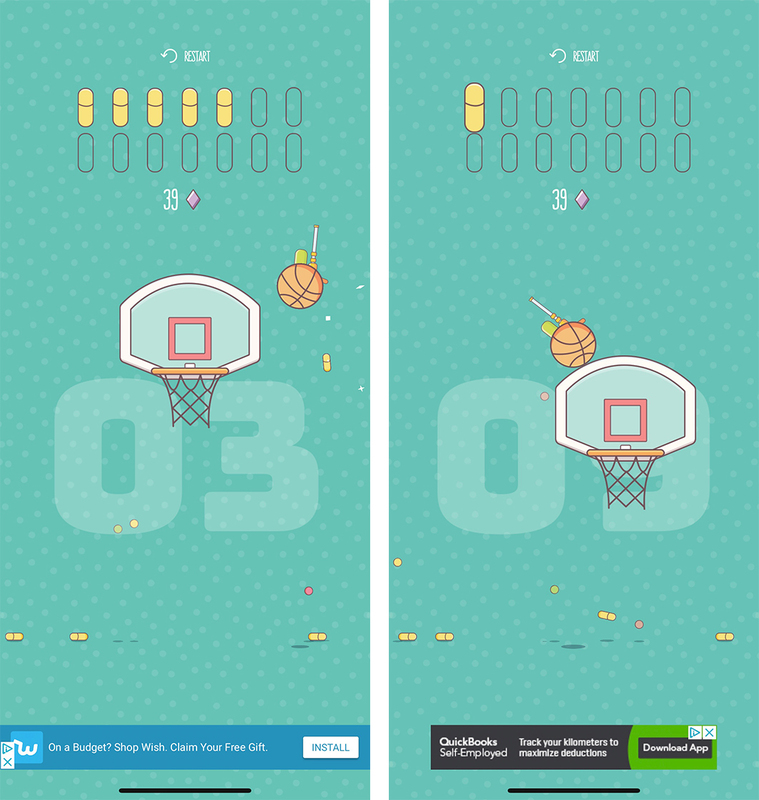 Shooting Hoops also features lengthy video ads that appear on its game over screen. Thankfully these ads are only visible in the game’s first eight sessions. That said, All ads can be removed from the game for $2.79 CAD. Still, Shooting Hoops is the most fun I’ve had with a mobile game since REKT. Shooting Hoops is available on iOS for free.